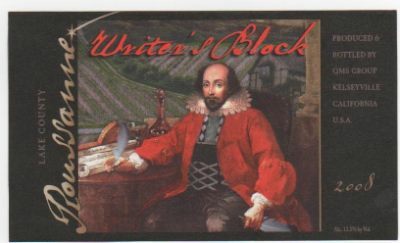 I first found out about Wine Blogging Wednesday in late February of 2005 when Andrew from Spittoon sent me an email inviting me to participate in WBW 7. Back then the wine blogging world was a small group of sites and we frequently commented on each others posts and traded emails. I was intrigued with the idea of a monthly virtual wine tasting event and have participated in 46 of the 72 past events, hosting 4 times. This month’s host, the writer behind the Corkdork blog, has asked us to revisit the wine that first sparked our interest in wine. My story starts in 1979 when I was in college. At only 19, I was under the legal drinking age in California where I was born and went to school but I spent summers in upstate New York where the drinking age was 18 at the time. Over the summers of 1979 and 1980 I tried just about every form of alcohol but settled mostly on beer as mixed drinks never appealed much too me and the wine I had locally was mostly from Taylor and not very appealing. Since I was summering in Rochester, New York just a short drive to the Finger Lakes AVA you might think it was this regions’ wines that sparked my interest first but, sadly, it was not. But my early experiences while in New York did plant the seeds that bore fruit when I turned 21 and was back in California. After a couple years studying film at UC San Diego, I transferred to California State University at Chico. This was about a 3 hour drive to Napa Valley but as college students we had plenty of weekend time and my Datsun got very good gas mileage. We also heard wineries didn’t charge anything for tasting which fit our budget perfectly. So one Saturday not long after my 21st birthday in late 1981 my girlfriend and I drove to the Napa Valley to wine taste. Back in those days I knew nothing about wine. In fact, I was so ignorant that I mispronounced most of the grape varieties (Meer-lot, anyone?). It was with this lack of sophistication we ventured up Hwy 29 and pulled into our first winery. If memory serves this was the Robert Mondavi Winery in Oakville where we not only got an interesting tour but a very informative guided tasting. And the wines tasted pretty good, too, particularly the whites (Mondavi Fumé Blanc is still a sentimental favorite). I also remember visits to Sutter Home (pre- “Home of white Zin” days) and Louis Martini on this first visit. We liked a lot of the wines with our favorite being the Sutter Home Muscat (now somewhat ironic given Muscat’s resurgence in popularity over the past year). Anything white and sweet filled the bill. Everyone starts someplace. Months past and we revisited Napa Valley a few more times. As we gained a bit more knowledge and confidence we visited new and different wineries. 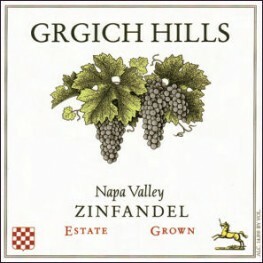 One of these was Grgich Hills Cellar right off the main highway that runs north to south on the western side of Napa Valley. This was in early 1982 and the winery had only been open for 5 years. I remember entering the nondescript tasting room and tasting their Chardonnay. And while this wine was very good it was their Zinfandel that first sparked my interest in wine. Poured by a jovial man in a beret, the wine burst with red fruit on the nose and in the mouth finishing with supple tannins that seemed to melt like bittersweet chocolate. I had tried Zinfandel before but this wine was the first that truly spoke to me and compelled me to learn more about the variety. It was a couple years later that I figured out the man in the beret who poured me this Zinfandel was none other than winemaker Mike Grgich. Four years later the second wine spark happened. By then I was working for Kodak and we had lived in Rochester, New York for a year and a half. This was the time I first discovered Finger Lakes Riesling and we spent many weekends tasting along the wine trails there. But it was not the local wines that produced this second spark but a well-known Napa Valley Cabernet. Over the previous 4 years I had read several wine books and had tasted a lot of wines. And while I still liked Zinfandel quite a bit drinking Lytton Springs vineyard as often as I could afford it, Cabernet Sauvignon was my latest obsession. I read all about the top Napa Valley Cabernets and drank Bordeaux as often as I could. I had received an award at work that was a gift certificate to a nice local restaurant with a very good wine list. I thought I might find a nice red Bordeaux to match with my prime rib as there were not a lot of California Cabernet on upstate New York wine lists even in the mid-1980’s. 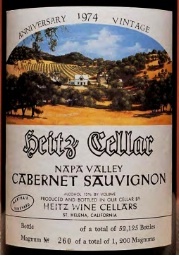 So imagine my surprise when I saw Heitz Cellars Martha’s Vineyard Cabernet from the 1974 vintage on the list. And it was even available by the glass at the absurd price of $25 for a small pour ($52 in 2012 dollars according to WolframAlpha). It took me only a millisecond to order this glass since we were spending Kodak’s money and I couldn’t imagine ever seeing this wine by the glass again (I haven’t). And the wine didn’t disappoint. I still remember the aromas of mint and eucalyptus that this vineyard is known for along with tobacco and a pleasing earthiness. In the mouth this wine defined Napa Cab to my developing palate. Cassis, blackberry, and spices finishing long with great balance. I can’t remember the level of tannin but I think they were still settling down as the wine was only 12 years old at the time I tasted it. I would have liked to have revisited one or both of these wines but I’m afraid the Heitz Cab is selling for $800 a bottle and I would bet the current vintage of Grgich Hills Zinfandel is vastly different than the 1978 or 1979 I tasted at the winery. But I don’t think this matters much as these wines live in my memory as turning points that made me want to learn more about wine. Eventually this led me to start this blog in order to have a place to send friends who were always asking about which wines to buy. Without Wine Blogging Wednesday I probably would not have told this story. Thanks go to the Corkdork for hosting and for a great theme. A lot has changed in the nearly 7 years I have participated in Wine Blogging Wednesday but there is nothing like it. Hopefully this will again be a monthly feature here if we get enough bloggers participating. Just a friendly reminder that Wine Blogging Wednesday 73 is just two weeks away. Our host, The Corkdork, has asked us to revisit the wine that first got your attention to learn more about wine. This could be a carafe of rosé in Paris, Sassicaia 1988, a random bottle of Cahors or Inglenook Cask 1958. Or it could be my wine revelation, the 1974 Hetiz Cellar Martha’s Vineyard Cabernet. Whatever sparked your deeper interest in wine, please join us on January 18th for the next edition of our monthly virtual tasting. All you need to do is post your thoughts and/or tasting notes somewhere online (your blog, Google+, Tumblr, Posterous) and let the host know. I hope we will find many great stories of wine enlightenment in the process. Reminder: WBW 71 Is This Week! It seems like is was just a few days ago that I announced the next edition of Wine Blogging Wednesday but it has been nearly 3 weeks. So just a friendly reminder that WBW 71, “Rhones Not From The Rhône,” is in just two days. And it’s easy to participate; just pick up a wine made mostly from grapes best known from The Rhône but not made there, taste it and post your notes to your blog. No blog? Well email your entry to me and I will post them up on the Wine Blogging Wednesday Posterous. But you could also blog on your own Posterous, Tumblr or even Twitter profile. I’m hoping to see a large turnout this month and find some great Rhone-styled wines from regions other than Frances’ Rhone Valley. Need more inspiration? Check out Jay McInerney’s piece on Viognier from this past weekends’ Wall Street Journal. And don’t forget to use our hashtag #wbw71 when you announce your entry on Twitter or Facebook.